Clogs: No matter how well you try to prevent them, clogs happen. If your home’s pipes are clogged, it can cause sewage to back up into your home. You’ll need to determine the extent of the problem. For instance, do all of your toilets or bathtubs create backflows? If so, the main sewer line may be clogged. Mother nature. Heavy spring rainfall puts a strain on your city’s sewer lines, making them work overtime. Sometimes the public sewer can’t manage the excess rainfall, creating a problem for homeowners. Additionally, tree roots can create holes or cause other damage that affects the pipes. Damaged Sewer Lines. Older sewage systems and those that have endured wear and tear do falter, causing sewage backups that lead to flooding in your home. Dispose of grease in garbage. Cooking oil and grease will harden and crack your pipes, preventing debris from properly draining. This is why you never want to pour grease down the kitchen sink drain. Dispose of paper products in garbage. Never use a toilet to flush paper towels, feminine products, diapers or any other products that can clog your drain. Replace old pipes with plastic. Plastic pipes will endure longer than other materials. Don’t plant certain trees too close to your home and cut any roots that seem unwieldy. Do you have a backwater prevention valve? This is something to consider. Installed into your sewer line, backwater valves will protect your home from dangerous sewage. Need immediate help from a professional? 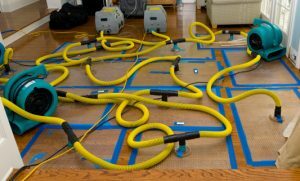 Do you have sewage backup in your home? Please do not try to handle the situation yourself. Contamination poses serious health risks to you and your family. Call ServiceMaster and we’ll send our seasoned restoration professionals to your home to remediate the sewage damage.